"Mabel White" was appointed the nickname to Deborah Dolen by her late husband, who noticed she was never short on energy or ideas. Never running out of projects to work on, she will tell you, she always stays fairly happy. She will tell you "I have never met a busy person who was depressed." Deborah became a widow in her early 30's. She suddenly had the added challenge of remaining successful as single parent of three teenage daughters, with one income and one energy level. Luckily that energy level is a high one. Deborah considers herself and her three daughters as successful. Her entire on-line e-book library of every book and article she wrote is free to those who write her and are sincerely financially stressed. Please e-mail Deborah to state the situation and how this would help inspire or overcome personal adversity. Our paying Members are great and will not mind. Now a bestselling author in the DIY section on Amazon, Deborah Dolen is the author of the motivational book "Your Own Lemonade Stand" clearly states that, falling means to simply get back up and jump higher! She focused on human potential at Eckerd College and formulated "models" for success that are described in her Lemonade Stand book. Her collection of winning ideals are posted within this site. Click here for the archives of her free public work. Please find Deborah Dolen's books on Amazon Kindle or Barnes and Noble Nook. Deborah Dolen really loves Twitter and Pinterest so please feel free to follow her on those platforms. "Negative thinking is perhaps the most extravagant, wasteful indulgence imaginable. Deborah loves to cook so much, she found sifting around in drawers for utensils took too long. Now she hangs every major utensil fashionably on her kitchen wall. She also finds spices much quicker to access arranged by alphabet laying flat in a drawer. To see more about Deborah click here. She will always love to make her own lotion, crème, soaps, candles and toiletries for her family and friends. 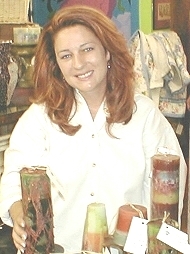 Deborah is also a syndicated columnist for the largest on line newsletter "Dollar Stretcher," has written 22 craft books, and 4 recipe cook books, countless e-Books and 8 TV DVD Video "How to" movies in focus areas such as making candles and floral design. She enjoys sharing information because she knows back when she worked 9 to 5, she never had the time to figure out easy, affordable and fun things to make at home. To inspire the home crafter to make their own products for themselves and family by providing the highest-quality products, education, ideas and support necessary to unleash unlimited personal creativity through the following mediums: e-materials, books, CD ROMs, DVD Videos as well as periodic newsletters. At Mabel, we simplify older recipes touted by other toiletry makers once we learned the basics. Like, we use a blender, we do not sit there and hand mix anything with a spoon for hours--as well as a microwave for most natural products--not the old double broiler method. We are after what we call "QANEEC" pronounced "Kawneek" meaning: Quick, Affordable, Natural, Easy, Effective, and Cool. This term was created by Mabel White.